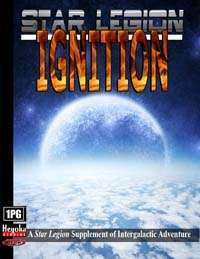 NOTE: This product requires the Star Legion game published by Deep7. This is a supplement for the 1PG game of space opera. So what'll you get for your buck n' some change? Expanded base classes: Bureaucrat, Criminal, Law Enforcement, Merchant, Mystical Order & Soldier. Optional rules for exposures to vacuum, alien environments and radiation; designer bioweaponry, alien impregnation, bodily shock & trauma, burning, falling, drowning & suffocation, freezing and electrocution. This title was added to our catalog on August 18, 2007.